Today, as part of our Delicious Dishes series, I thought I would add one of the all time favourites of our customers, our home-made Tiramisu. 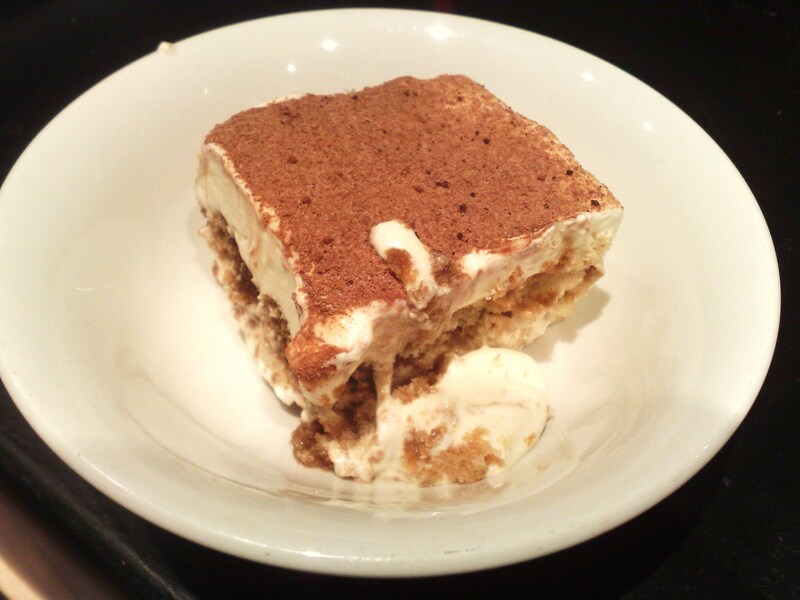 Now, I know that there are certain restaurants out there who unbelievably buy in their Tiramisu, shock horror! Perhaps they don’t have anyone as skilful in the kitchen department as we do in Lidia, Costanzo’s daughter who is the master in the art of Tiramisu making! Lidia really makes a spectacular Tiramisu. If you have been unfortunate enough like me to have tasted inferior bought in Tiramisu in a restaurant, you can see and taste the difference in an instance. The Caprese Tiramisu is light and fluffy and doesn’t make you feel like you’ve just eaten a tennis ball. With just the right quantities of coffee, amaretto……(I have to stop here, can’t be giving away our recipe!) it is not too rich, not too sweet and just melts in your mouth. It is the law in the Ristorante Caprese that you have to leave enough room in your stomach to taste at least a couple of mouthfuls of our Tiramisu. Whilst searching the net a few days ago I even found that someone had tweeted on Twitter back in December (when we were having very heavy snowfalls) that perhaps they might be snowed in the Caprese with only our tiramisu to live on, at least he would die happy! So if you happen to venture in for the first time you have to try it. Of course we have other sweets to choose from also which I will feature in our delicious dishes but top place has to go to the Tiramisu, it really is to die for! This entry was posted in Delicious Dishes! and tagged Caprese Restaurant, delicious, italian food, Tiramisu. Bookmark the permalink.